If you are a gardener and welcome change, Adams County is an ideal place to live. Adams County’s four distinct seasons offer great diversity for the gardener. Each year we are exposed to four unique yet overlapping seasons, each with its own pros and cons. As we approach the beginning of the fall season, we are blessed with a landscape of phenomenal color (a pro); however, that also means leaf clean up (a con). Let’s talk about the pro—Mother Nature’s display of vivid fall foliage color prior to settling down for winter. There are three factors that influence the fall foliage change: leaf pigment, length of night, and the weather. There are three types of leaf pigment. Chlorophyll, which is necessary for photosynthesis, is the dominant pigment that gives leaves their green color. Carotenoids are pigments that produce yellow, orange, and brown color; these are a dominant pigment not only in autumn leaves but also in corn, carrots, and bananas. Anthocyanins are pigments that give the red color to leaves as well as cranberries, apples, cherries, and plums. During the active growing season, chlorophyll is continuously produced. It is a dominant pigment in most tree leaves, which helps them remain green. As we enter into fall and the length of daylight decreases and our nights become longer, chlorophyll production begins to slow down. Eventually, this production is stopped altogether and as the chlorophyll decreases, the green color of the leaves fade and the carotenoid that remains begins to produce brilliant yellow, gold, and orange colors. These colors are seen in the ginkgo, birch, and some maples. Anthocyanin, or the red pigment, is produced in the fall in response to bright, sunny days to help increase sugar production in the leaves. Many maples, oaks, and sweet gums display red or scarlet foliage. The third factor is weather. 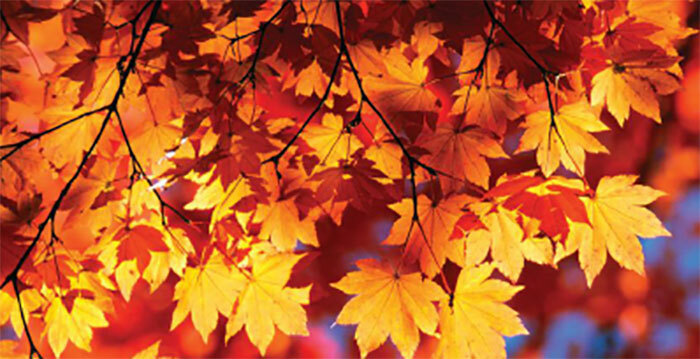 The amount and brightness of fall foliage in any given autumn season is directly related to weather conditions. Temperature and moisture are the two main influences on fall color. Warm, sunny days with cool but not freezing nights usually result in the greatest display of color. Sunny days and cool nights help produce more sugar in the leaves, resulting in more red and scarlet colors. Since carotenoids are ever present in leaves, the color yellow is usually constant from year to year. The amount of moisture also determines the intensity of fall color. Ideal fall color usually occurs when we have experienced a warm wet spring, adequate summer rains, sunny fall days, and cool nights. Lack of moisture throughout the growing season can definitely impact the quality of our fall foliage color. Frost, high winds, and storms during the fall can also affect and damage fall color. Living in an area with four distinct seasons allows gardeners to plan their landscape to accentuate the highlights of each season. Fall is the ideal time to cruise the countryside and your local garden centers looking for new specimens with brilliant and interesting color to add to your landscape. Happy gardening, and enjoy the fall planting season!